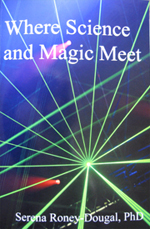 "Where Science and Magic Meet,"- first published by Element in 1991. A revised, up-to-date, third edition has been published by Green Magic Books. I have copies at £10 + £2.50 p&p. "The Faery Faith" is published by Green Magic. I have copies @ £10.00 + £2.50 p&p. CD 2: Yoga Nidra II, Breath meditation. CD 3: Ujjayi breath and Tratak candle meditations. CD 4: Omkar chanting & Anulom Vilom meditations. Some of these are also available as MP3 downloads and are listed on the Download page alongside their sleeve notes. Both places will supply mail order.